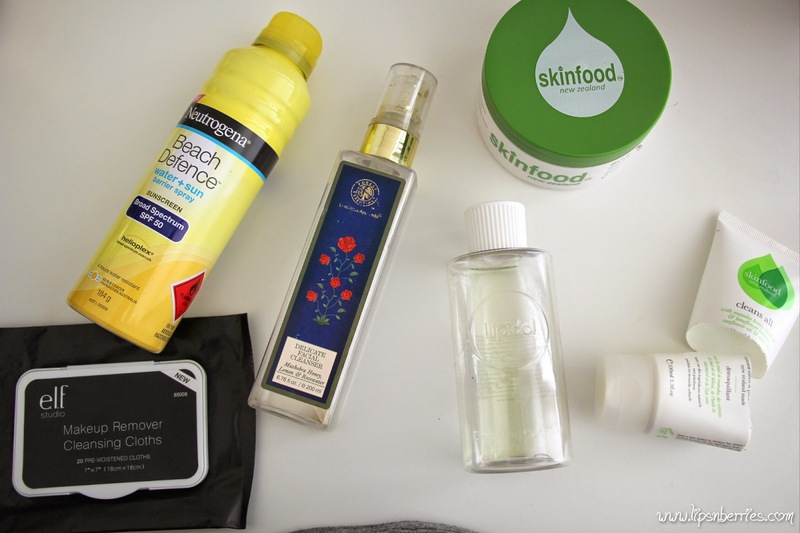 January 2015 Empties! 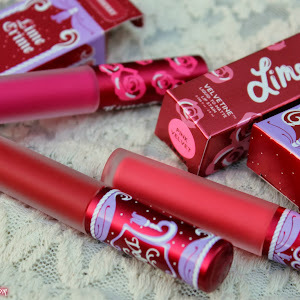 | LIPS n BERRIES! Hello World! Feb is upon us and it is officially MY MONTH! First wedding anniversary, Birthday & Valentine's Day. It's raining gifts. Lucky me! 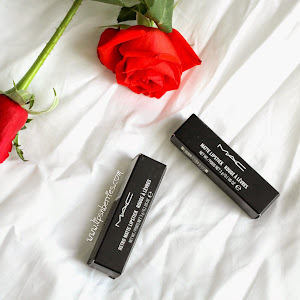 (Did you check out my Anniv gifts? It's up on Instagram & Facebook). I'll share birthday ones soon too.Whoop Whoop! Anyways, back to my monthly post.. 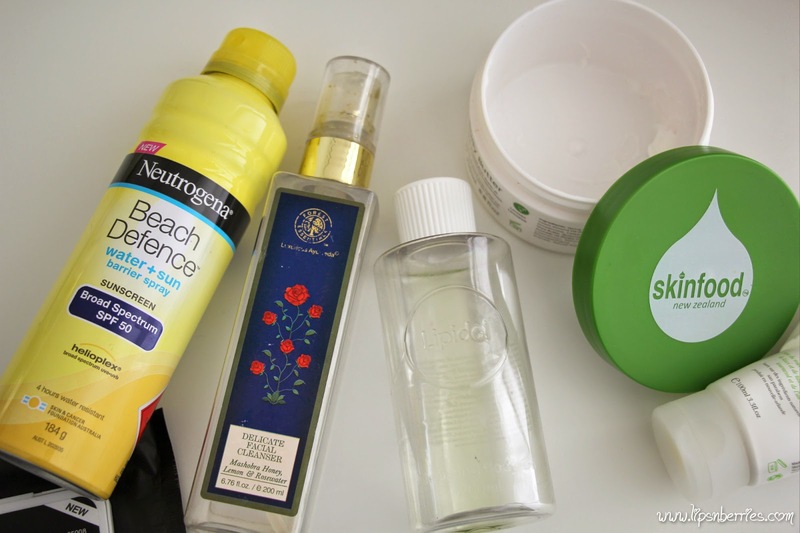 The January empties! It's quite a mix bunch. 1. 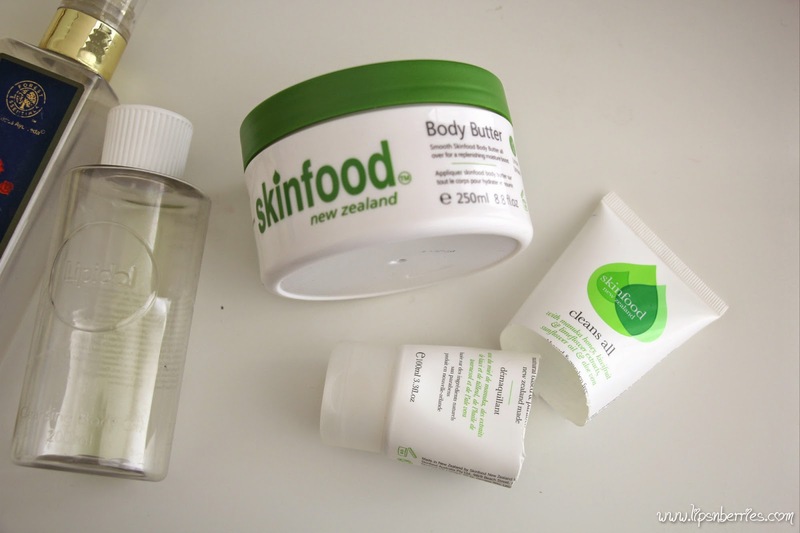 Skinfood NZ Body Butter ($18.99 NZD) - You know I like most things from these guys and this body butter was no different. 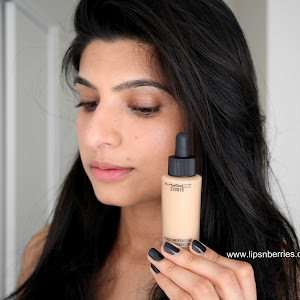 A quick summary - White in color, citrus-y notes, moisturizing & fit for summers too, absorbs pretty quick & non greasy. It has good stuff like Almond & Jojoba oil, Shea butter, Honey & Coco butter. Oh! Parabens free too. I'd quite possibly consider it again if I spot it on special at Countdown. Can't justify buying on full price. 2. Forest Essentials Delicate Facial Cleanser - Previously spotted in this post here with my absolute favorite facial toner.You know I'm crazy about anything Rose & FE Rose range is THE absolute luxury. I can't quite describe its smell but its divine. It's when you mix rose water, lemon & honey literally. Soothing! I loved this facial cleanser too but I'm not quite sure if I'd buy it again. b. It says delicate... the reason why I picked it up for my dry skin, but its foamy & does dry out skin if you over indulge in cleansing. c. The 200 ml packaging is just impossible to finish off without getting bored. You get a lot of product & need only a drop each time. The bottle has lasted me awfully long. To the point bored you see. I guess I may just need a break from it. Its good, real good! Perfect with FE Rose Water but I'm just bored. Not buying anytime soon. 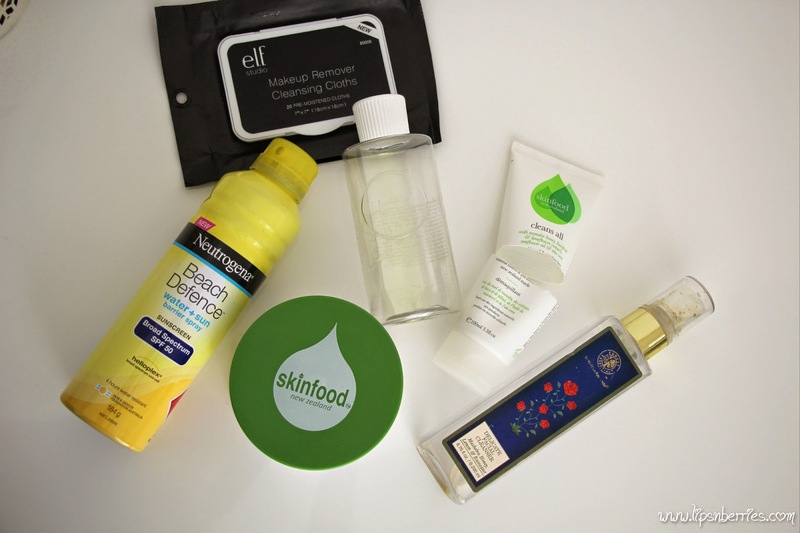 I'm trying out other FE cleansers too, so it's clearly a case of brand overdose. Do you feel me? 3. Lipidol Cleansing Body Oil - A brand that came out late last year - Lipidol is a range focused on moisture retention. 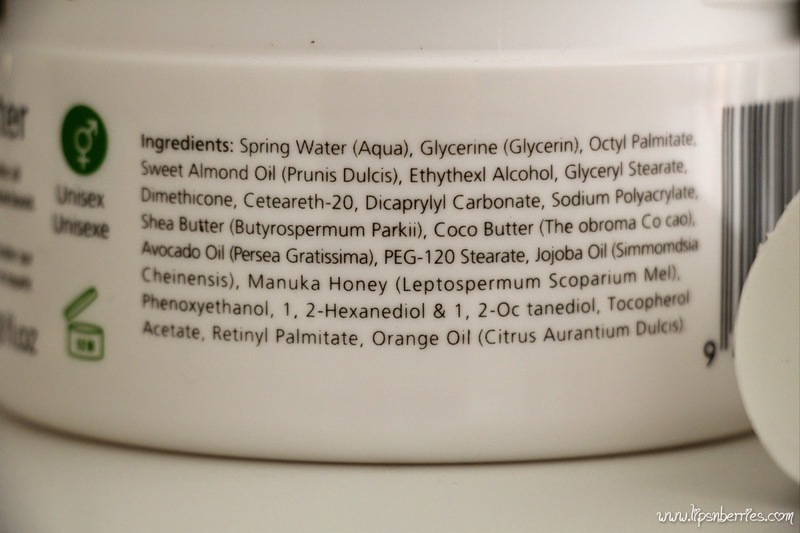 This cleansing body oil embodies the brand intentions to the T. It's non drying, like totally. You put the oil on body, massage, rinse, it emulsifies & washes off. No stickiness no mess. Now only if you can convince yourself of a non-foamy shower. I'm kinda not. Full review here. 4. 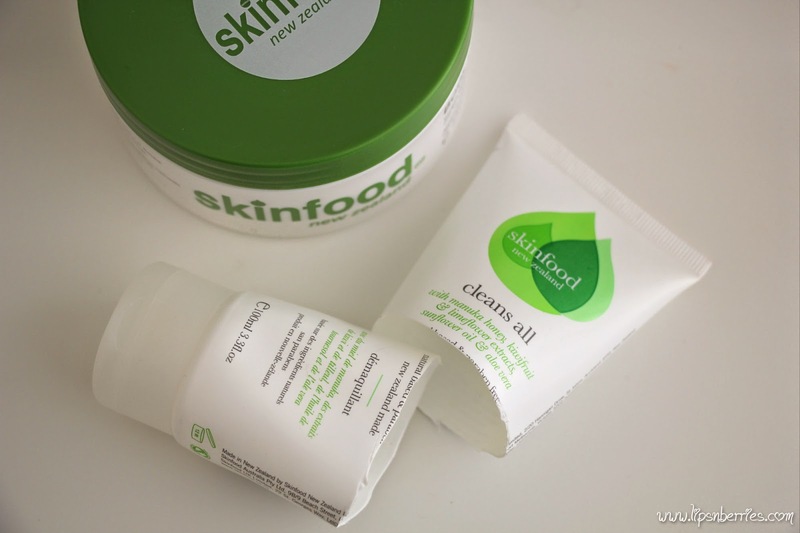 Skinfood New Zealand Cleans All Cleanser ($13.99 NZD) - Now this is clearly my kinda cleanser. You know the kind that feel more like a cream than a cleanser. I clearly prefer non foamy for the face. My parched skin thanks me every-time I use it. Definitely buying it again but won't be recommending it for the oily or combination skin types. Full review here. Clearly a case of Love Overdose! 5. ELF Makeup Remover Cleansing Cloths - Cleansing clearly seems to be ruling this post like moisturizing was in December empties (here). These cleansing towels were a repeat buy from iherb.com. I prefer no-fuss cleansing while traveling. These were a bit of let down though. Kind to face but my eyes... Ouch! Red watery eyes. Not buying again for sure. 6. Neutrogena Beach Defence Sunscreen (About $20) - I bought this sunscreen out of plain curiosity. I cherish slapping on a sticky greasy sunscreen... said no one ever!!! A spray-on sunscreen was a thing of dreams. The second I saw it..I just had to buy. After finishing it off, I have mixed feelings. Its SPF 50 and broad spectrum Yay!! Yes! it is very handy. Yes! It sprays on sunscreen. But I still have to use my hands to smother it..making sure every inch of my leg is covered. Also, It gives out a very fine mist, half of which is lost in the air = Product wastage. So I'm not entirely convinced on the concept. In saying that I've already bought another spray on sunscreen as Sunshine is a fan of this spray on jazz (Boys!!) and also it comes quite handy to reach those nooks and corners that you might end up missing with traditional slip slop slap. Are you sold on the concept? That's it for my January empties. We're almost half way through this month already so Feb empties aren't far away either. 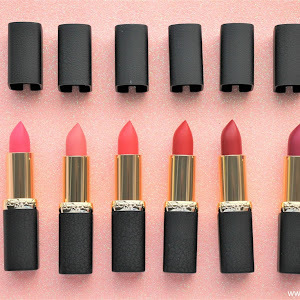 Did you end up finishing any products this month or last? Lemme know in the comments below. My Haircare Routine + some Tips n'Tricks! Valentines Day Mani- with a twist - fun n' girly!